This image claims that you can get protein from non-meat sources, citing Broccoli as an example. Do you really need meat to get Protein? 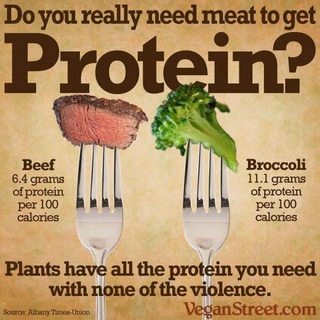 Plants have all the protein you need with none of the violence. My initial reaction is "NO WAY! That's not the same amino acids or structure or something..." but then I realized I have no actual evidence to back this up. I think the statement is technically correct, however, I can't shake the feeling that I'm not seeing the whole picture. The proteins present in food are all composed of a group of amino-acids. The amino-acids constitute the building blocks for many different chemicals made inside the body: in hormones, enzymes, DNA. encoding, RNA. encoding.... they play vital roles in the body's immune system, they constitute the neurotransmitters in the brain, the cortisol which is involved with stress response - in short we know a fair bit about their roles in the body, and the body and mind can't function at full capacity without them. Altogether there are twenty amino-acids which we need. Of those twenty there are ten which the human body can synthesize, the other ten are only able to be obtained through our diet, these ten are called "essential amino-acids". Animal proteins contain the amino-acids we can't produce ourselves, these are called complete proteins. A vegetarian diet would still contain eggs and dairy products which, together with the vegetable proteins would cover the full count of the required ten essential amino-acids. It appears to be the case that vegetable proteins are on the whole likely to contain these amino acids, but some of them may be present in only small quantities. It is therefore necessary to find a variety of vegetable sources in order to obtain a balanced diet of complete protein. Soybeans, quinoa (a grain), and spinach also are considered high quality protein. Other protein sources of non-animal origin usually have all of the essential amino acids, but the amounts of one or two of these amino acids may be low. For example, grains are lower in lysine (an essential amino acid) and legumes are lower in methionine (another essential amino acid) than those protein sources designated as high quality protein. Frances Moore Lappe, in her book Diet for a Small Planet advocated the combining of a food low in one amino acid with another food containing large amounts of that amino acid. This got to be a very complicated process, with each meal having specific amounts of certain foods in order to be certain of getting a favorable amino acid mix. Many people got discouraged with the complexity of this approach. It may not always be possible or convenient to eat healthily on a vegan diet, but there are plenty of food supplements containing the individual elements you may need for that hard to get complete diet. Using a search engine to seek: "vegan amino-acids" many websites offer individual amino acids and quite a few pharmacies/health and fitness stores in your local town or city probably do the same. They do in mine. It would then be advisable for the individual to ensure that they are buying not only the appropriate supplements, but ones not obtained from animals. Anyone embarking on a vegan diet would be well advised to seek advice from a dietitian about their specific requirements, particularly regarding feeding expectant mothers, children, young adults, the old and the very active or ill.
Refs: 1: Wagner, Ingrid; Musso, Hans (November 1983). "New Naturally Occurring Amino Acids". Angew. Chem. Int. Ed. Engl. 22 (22): 816–828. The bio-availability of these amino acids is not stated in the raw product, nor the cooked, nor is the RDA of any of them listed here. The claims on the above site regarding the relative protein contents of broccoli and beef (per amount measured arbitrarily in calorific content) are contradicted here with citations, notably of USDA’s Agricultural Research Service’s Nutrient Data Laboratory database. It gives a list of the essential amino acids and their RDA. taken from the WHO database. It is clear that to ascertain the minimum daily requirements of for example histidine, approximately 20 cups of broccoli need to be consumed per day. The story is similar for other essential amino acids. To most people this would make broccoli an unfeasible source of all necessary dietary protein. 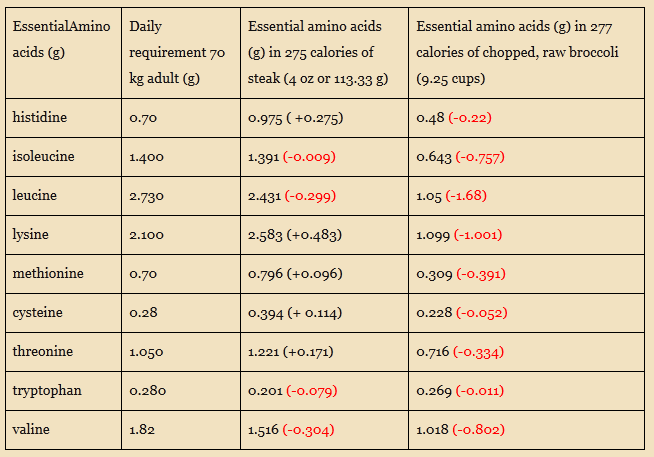 Let’s see how similar caloric intakes of steak and broccoli stack up when comparing how these two foods provide for essential amino acid requirements. A 275-calorie portion of steak (4 ounces) has 30.5 grams of protein and comes very close to meeting all the daily essential amino acid requirements for a 70 kg adult. A 277-calorie portion of broccoli is not only way more food—you’ll be chewing for a long time as you try to make it through 9 ¼ cups of broccoli—exactly NONE of the daily essential amino acid requirements for an adult are met: In reality, it takes twice that much broccoli, or over 18 cups, containing nearly twice as many calories, in order to get anywhere near meeting all essential amino acid requirements. While I’m willing to concede that individual amino acid requirements may vary considerably, I am not willing to concede that similar caloric amounts of steak and broccoli provide a similar supply of those requirements. Since most of the answers base their claims on numbers and are a bit shaky here's something from human physiology and bio-availability perspective. Of course, this just implies that protein is consumed in right mass amounts, but is it sufficient for life? 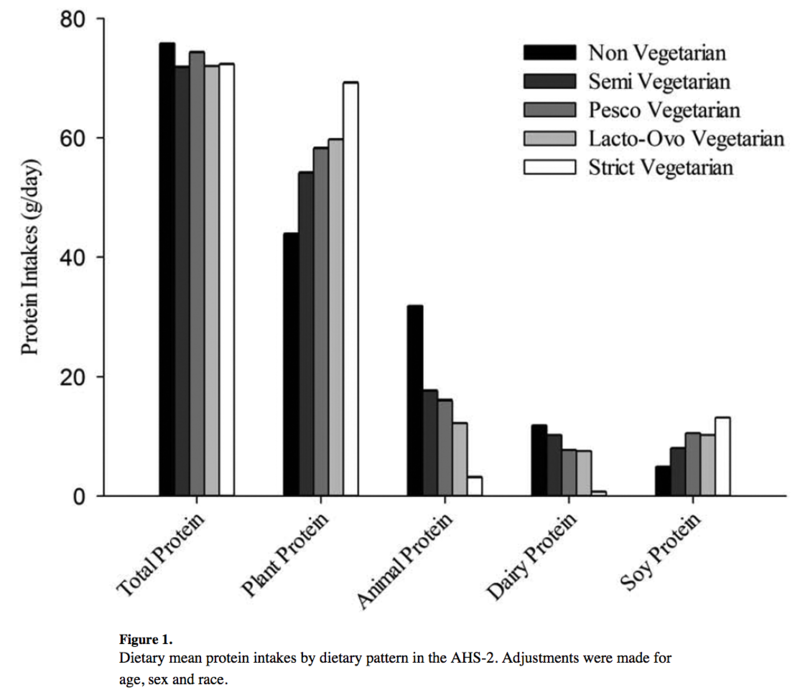 The paper above analyzes protein intake of many nations (figure is taken from it). To worry about protein in situation where there is no starvation is unnecessary. The amounts of that protein are more than sufficient for proper body functioning. The body can easily from that material do whatever it wants, it won't require consumption of complete protein every single day for every single meal, there's no need for faddy protein combining, or complementary protein consumption. The conclusion is that, yes, one can get sufficient protein on a vegan diet, if one eats enough food in calories then the protein needs are most likely met. You do not need meat (or even milk or eggs) to get all the protein (with all amino acids required) you need. It is easy for a vegan diet to meet recommendations for protein, as long as calorie intake is adequate. Strict protein combining is not necessary; it is more important to eat a varied diet throughout the day. Adequate protein needs easily are attained through a well-planned diet. Broccoli is not really an appropriate food to be advertised as high in protein; one serving (1/2 cup, cooked, 78 g) contains only 2 g of protein. (NutritionData). The meat/broccoli comparison in the image in the question is misleading because it's "per 100 Calories." You need only about 50 g meat but about 300 g of broccoli to get 100 calories, and they both contain about 6.5 g protein (not 11.1 g for broccoli, as the image states). This selective benefit of the doubt for the traditional Western diet makes the official RDA safe to use (relative to current eating habits), but it is not reliable when used in this question because it will biased against diets that will be lacking in some amino acids when there is no hard evidence that the RDA for such amino acids needs to be met for optimal health. Similar studies have done in other such plant based populations with similar results. But here we have to note that people who live in such societies typically won't keep track of their amino acid intake, so they may actually get protein deficiencies from time to time. Nevertheless, they don't get heart disease. Autopsies on old people will not show any signs of atherosclerosis, while atherosclerosis already starts to affect our arteries at the age of ten. But absence of certain diseases doesn't prove that such a diet is healthier overall. A good test for the vegan diet would be studies were the protein demand is increased by letting people do heavy strength exercises and then studying the impact of a vegan diet relative to other diets. It's all good and well to point out that you can get enough of all the essential amino acids in theory, what matters is if you can demonstrate that you are able to stick to a diet that gives you all the required amino-acids on the long term. Such studies have not been performed. But what we can do is look at whether there are vegan bodybuilders and how competitive they are. The absence of vegans in that professions or if they all perform poorly would be a red flag for the vegan diet. It turns out that there are a number of vegan body builders, some like Frank Medrano supplement with protein powders while Patrik Baboumian manages to do with only vegetables, as he explains here. The most famous vegan bodybuilder is Jack Lalanne, but later in life he did start to eat egg whites and fish. So, we can say that there are no good reasons to believe that a vegan diet would lead to protein deficiencies in practice. My personal opinion for which I cannot find independent sources, is that doing a lot of exercise is important for getting enough nutrients from a vegan diet. A lot of the foods you eat in this diet have a low density in nutrients (not just protein, also minerals like calcium), so you must eat large volumes. E.g. I regularly eat 1 kg of potatoes and 500 grams of broccoli for dinner, which isn't all that difficult if you run for an hour a day at a fast pace. This meal alone contains almost all the amino acids I need.